It’s time once again for Tea Time Tuesday. Today I would like to share with you one of my favorite teacups and fresh flowers from the garden. 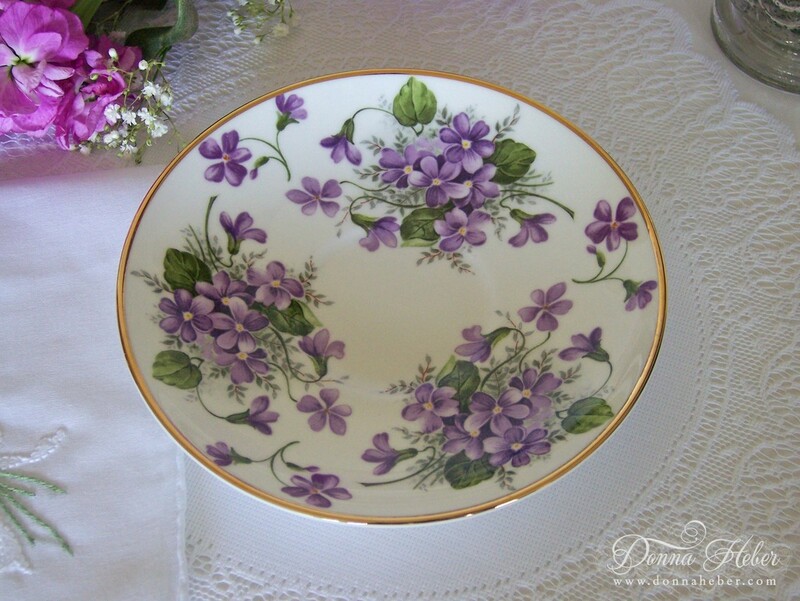 This pretty pattern is called “Wild Violets”. Isn’t it just gorgeous? 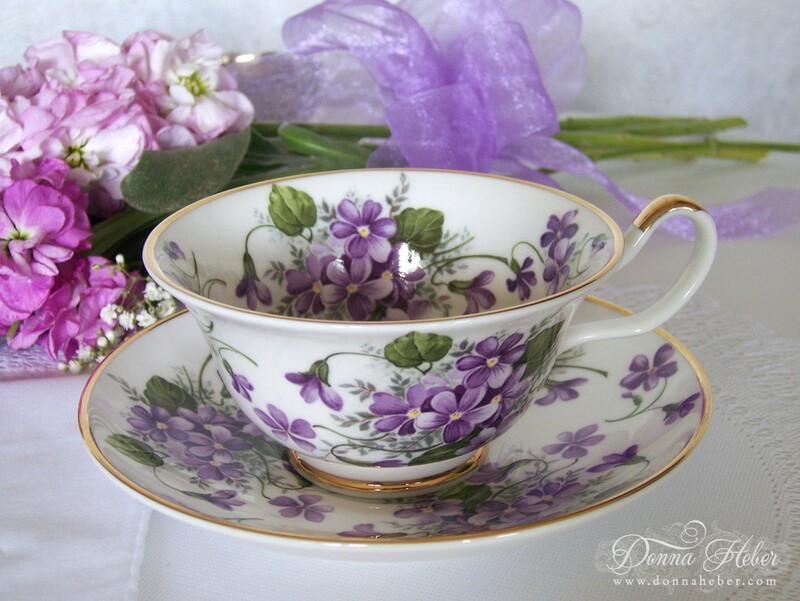 The delicate clusters of purple violets gives this cup a spring feel. This set was made in Staffordshire England by Sheltonian. I love the comfortable loop handle of this English bone china and the 24K gold trim. A look at the pretty saucer. 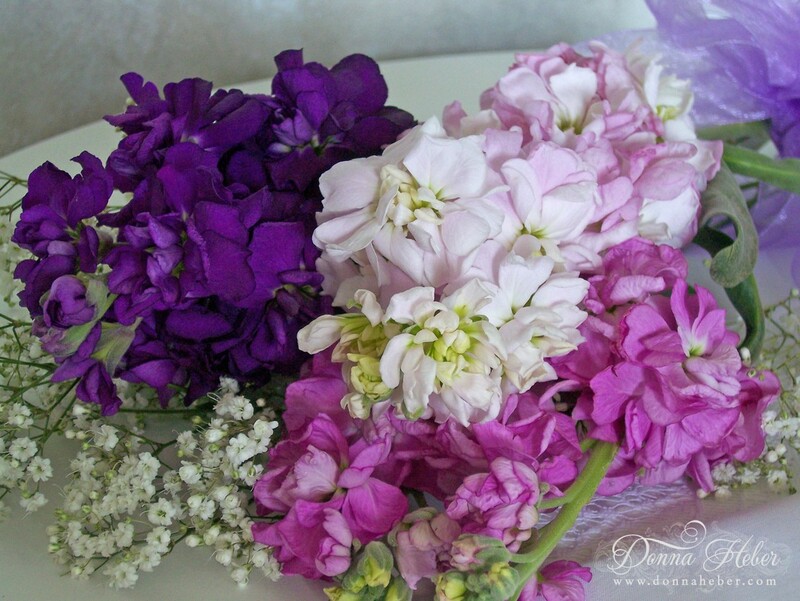 I have picked some fresh double-flowered stocks (Matthiola incana) and baby’s breath. Their scent pervades an entire room. So please join me today for a soothing cup of Chamomile tea. This golden herb is a favorite to relieve anxiety and will bring a smile to your face with its fragrant blossoms and sweet flavor. This herbal infusion is delicious served with honey. May I pour you a cup? 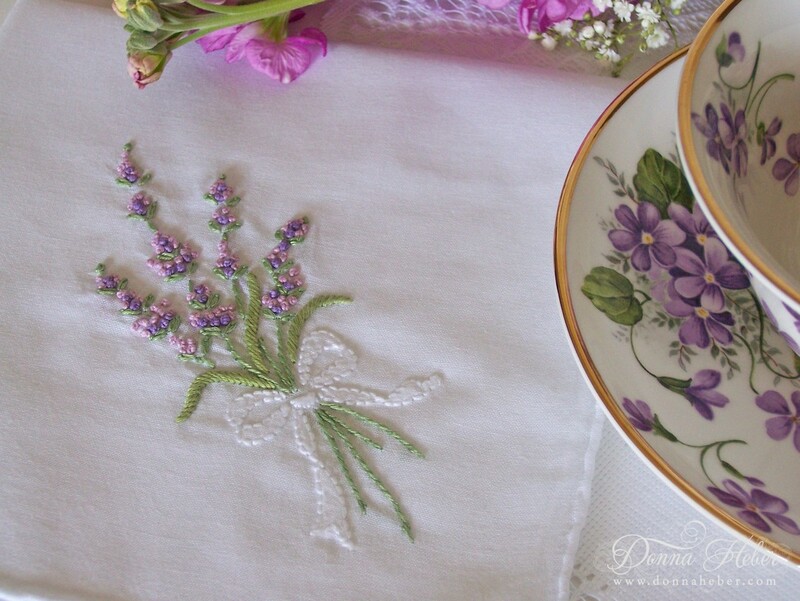 This white handkerchief with a rolled edge has a beautiful embroidered lavender flower in the corner. 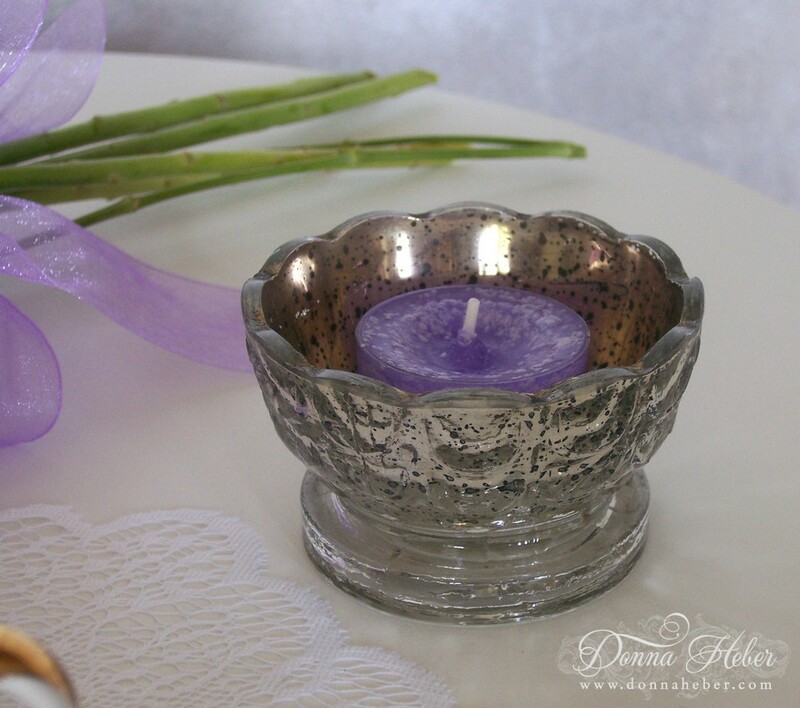 The antique silver mercury glass votive holder has a great vintage feel with its soft scalloped edges. I love purple so I love this post! The cup and saucer are lovely with their wild violets. The handkerchief and the tea light ... perfect! Happy Tea Day! you have decoreted you table perfectly donna. have a nice cup off tea. Looks lovely and I love the designs. The flowers are of course beautiful! I just love this teacup, so pretty, as are your flowers from the garden. The handkerchief with the lavender is very nice but then anything with lavender is. Donna, your tea cup is so, so pretty! 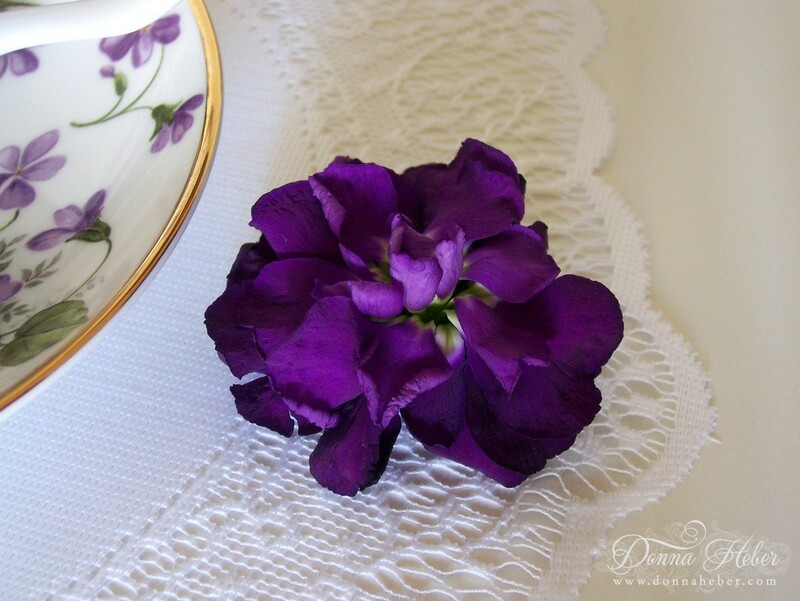 I love violets and the shape of this teacup is just lovely! Lovely blooms and hankie too! Very pretty post! Thank you for sharing this with Tea Time and have a delightful day. yes, I agree, this is one of the prettiest cups I ever saw with violets. Very very nice. And you decorated all so lovely, too. Thank you for having me for tea. So beautiful. Violets. The teacup is a treasure. Love the purple tea cups! Very pretty! Gorgeous setting, and gorgeous colors. That who "cupscape" is adorable. I really love the lavender on the white handkerchief and the flowers blend perfectly. What a lovely spot to enjoy a cup of tea. this tablescape if very inviting and relaxing looking. This is such a pretty post! The pics are so pretty and the colors are so vivid!! It always make me happy to visit your site Donna. This is so simple, but yet so elegant and pretty. Thanks for sharing. Your tea cup is gorgeous, Donna! The stock is so pretty too. Beautiful setting for a cup of tea. 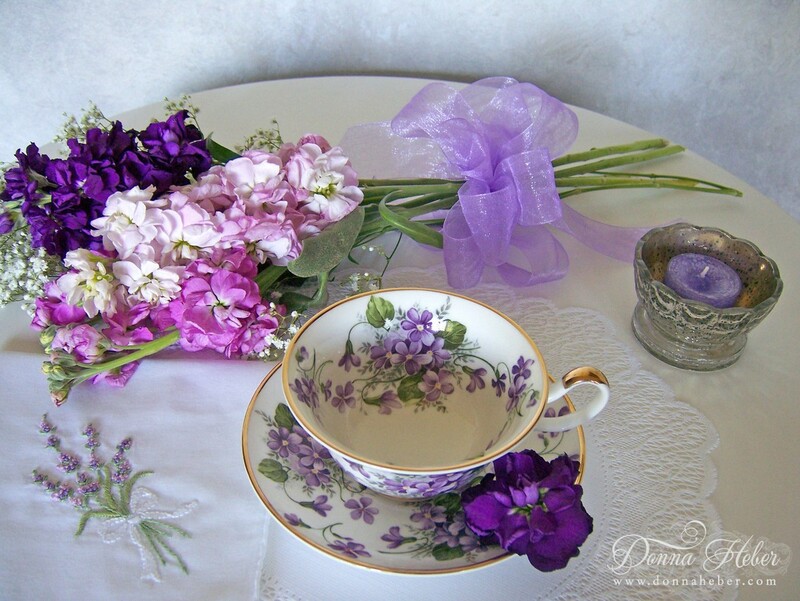 The tea cup and saucer set is so sweet with those violets. Such pretty photos! Donna Loved the vignette. Stocks have such a gorgeous scent. Liked the idea of using the tea cups I have as a bouquet holder...will be doing that for sure. Oh wow Donna!! I feel like I've just relaxed and had a lovely cup of tea with you! Stock is one of my favorite flowers too. Their scent is truly amazing! I love purple, in every shade! Love your garden - am in awe of you as a gardener and crafter. Thanks for sharing. I love those violets! Nice photos! It's all beautiful. 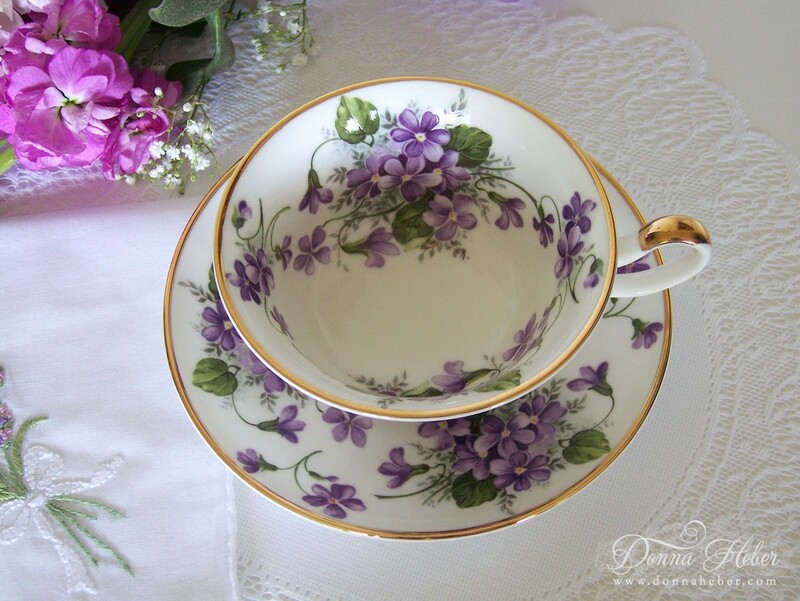 Your violet teacup is gorgeous and I really like the delicate handkerchief with lavender embroidery. You have a beautiful blog. I love purple and your violet teacup is so beautiful. It would be a joy to sit down and drink from it. That is such a pretty teacup and the embroidery on the handkerchief matches perfectly. Lovely tablescape. Your purple stocks are georgeous! This is truly beautiful! I love finding wild violets in m garden - it is a marvelous thing when something so beautiful is made to reflect the beauty around us! What a gorgeous tea setting! You know how I love my purple so, this tea just makes my heart sing! Everything is just so pretty Donna! Hi Donna, what a beautiful tea cup and saucer. Love it!!! Beautiful! Violets are the flower that remind me fondly of my Grandmother. Perfect like always!! I love the embroidered handkerchief and the votive holder. The tea cup is absoloutly beautiful. I always enjoy looking at these. I can see why the teacup is one of your favorites. I have a lot of wild violets that spring up along the woodlands and under our cedar trees. They are very delicate and beautiful. Love the napkin. So beautiful. My 15 yo would love this--purple is her favorite color.